Pork Congee: Breakfast of Pork Congee (Joek Moo). Kao Dtom literally means "boiled rice" and a kao dtom porridge tends to be a bit thinner than a Joek. 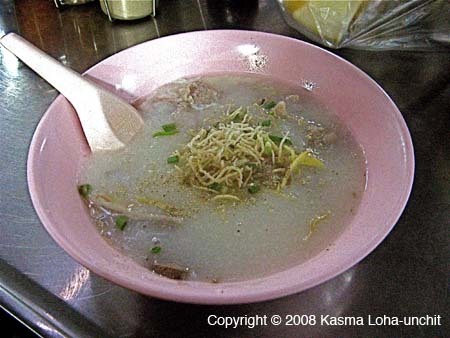 Also see Kasma's recipe for Rice Congee with Pork (Kao Dtom Moo). There's also a Congee article.